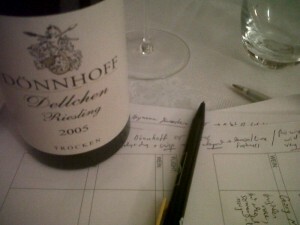 2005 struck me as a good year for some 22 top German dry Rieslings tasted in Berlin on 27 November 2011. But also a good example to indicate the difference between fine dry Burgundy and fine dry German Riesling. Let’s face it. 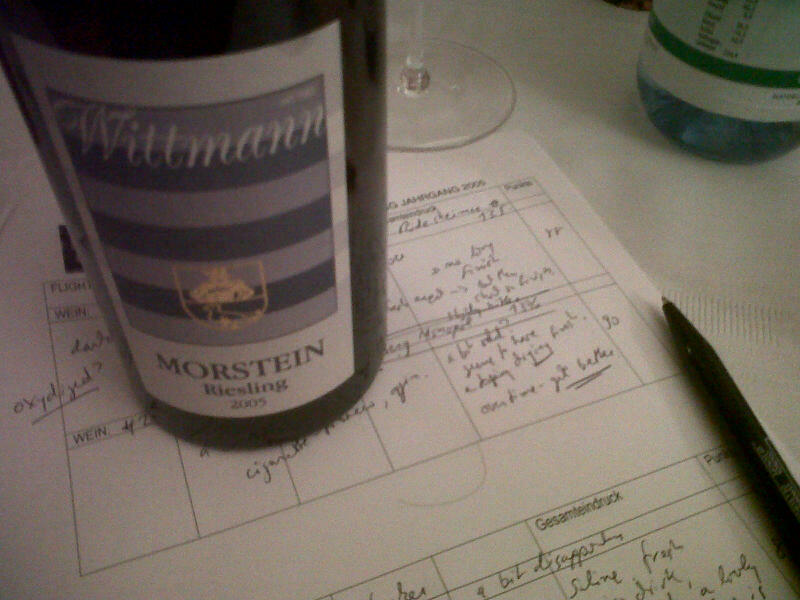 Dry in German can mean a bit sweet, at least for tasters like me, accustomed to most dry whites from France. Some exceptions, sure. 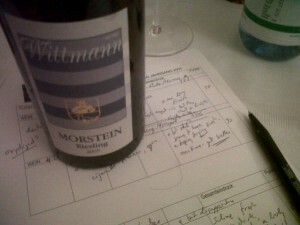 But overall, comparing Burgundian Chardonnay with dry German Riesling – as some like to do – is rather apples and pears. Of course both are superb wines. And different. 2005, a vintage known for richness and fat, really highlights this difference. Perhaps a vintage like 2010, with more acidity, would make it less obvious? 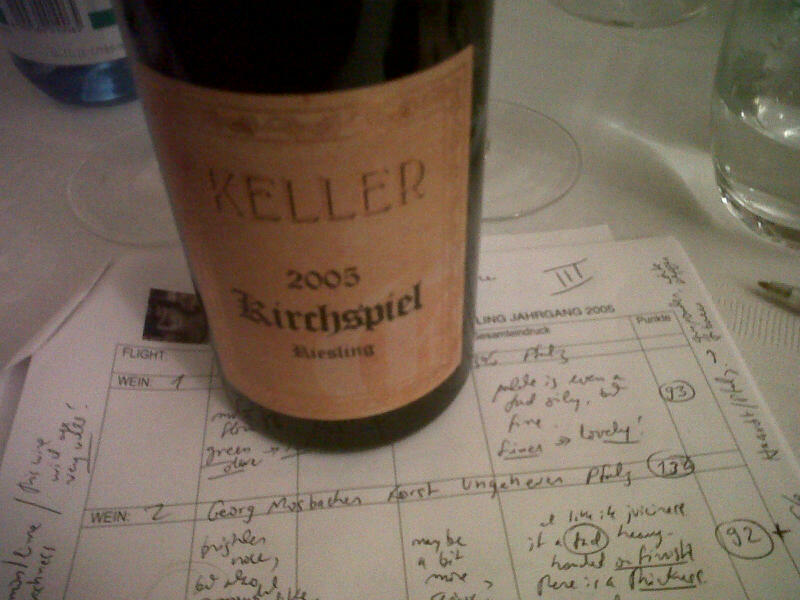 First off, allow me to heap high praise on Jürgen Klucken for peerless organization and a terrific meal, along with extra wines for the various dishes, which included a velvety delicious home-made pumpkin soup with fresh croutons, a delectable quiche with mini asparagus, a fabulous Coq au Riesling (but of course), and a pineapple crumble with ice cream. I stayed at the Palace Hotel, which cost €119 per night, including a superb breakfast. The comfort and attention to detail – a morning newspaper brought to the room free of charge, a welcome cake (which I did not touch), a request for a wake-up call – were all included in the most friendly manner. But that is Berlin for you: a friendly city. You make that remark to Berliners and they cannot believe it. But believe me, living in France, the difference is eindeutig. For €119, try to get the same quality in Paris. The tasting had good rhythm: we started about 7 pm and ended at 1 am – lots of wine to taste, with dinner in between, and plenty of conversation and discussion. Jürgen served the wines blind in flights of two, to best compare. After tasting each pair, some discussion ensued, with the more experienced tasters guessing from which region the Rieslings may have come. Lovely glassware from Zalto Denk’Art, glasses that are very light and thin and made of crystal. I will buy some. Uhlen Heymann Löwenstein “Roth-Lay” (Mosel). Now this disappointed everyone. It was very likely a faulty bottle, displaying an overly cheesy aspect. Not rated. With first serving of dinner: Kürbissuppe- Pumpkin soup. 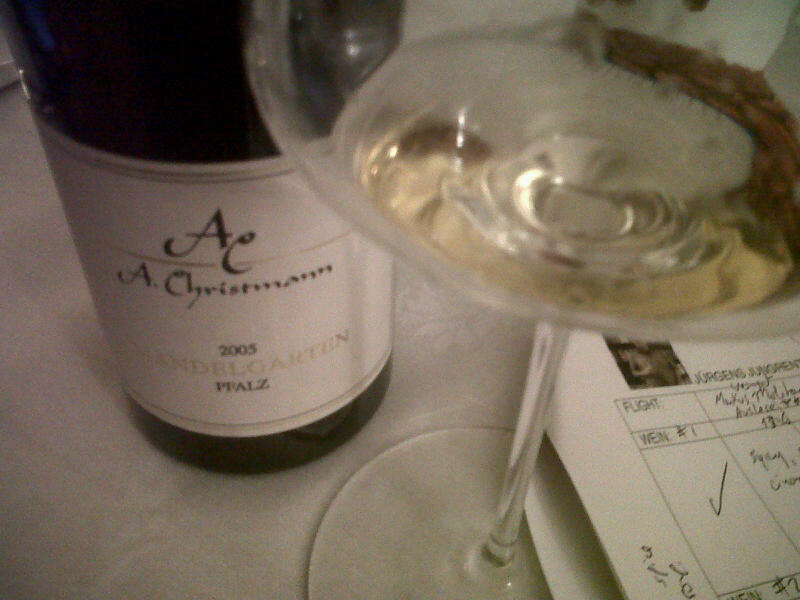 Here we had a delicious Heymann-Löwenstein Röttgen that did show some botrytis spice and richness, but a perfect match for the soup… certainly much better than the problematic bottle earlier. 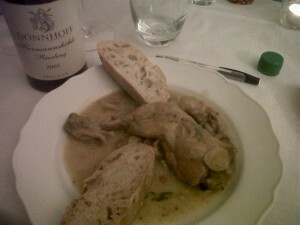 The Coq au Riesling was perfectly prepared, with tangy skin and tender meat, matched with a fine Riesling based sauce that flavored the accompanying mushrooms and carrots and onions. Just delicious. Georg Brauer “Nonnenberg” Monopol (Rheingau). At 13% alcohol, this wine seemed slightly faulty at first, with a bit of cheesy flavor. But time in glass helped, with notes of tobacco and freshness, although it seemed also to have a drying finish. 89? Keller Hubacker. A bit of a letdown, because it seemed so disjointed: I noted saline freshness on one level, but then all too much sweetness on another, lacking cohesion. The nose, however, seemed super promising: one of the most complex of the tasting, with ashes, citrus, apricot and melon. It just did not follow through on the palate, which left an overall impression of heat on the finish… but it could well be that this wine just needs time to come together, given the quite fascinating nose, so let’s just say 89 for now, but potential for a higher score in the years to come? We also had a lovely Suduiraut Sauternes 2001 from half bottle that needed time to open up. At first almost cloyingly sweet, but with time in glass, peppermint and black tea notes came to the fore, with a bit of cinnamon. This wine certainly needs time to lose some of that youthful baby richness… and it should reward patience. Even from a half bottle, 10 years later, this Sauternes is still far too young! Great to find this web-site. Thanks for a good read and some good info as well. Will bookmark the page and periodically drop by. Cheers. Many thanks for sharing valuable information about 2005 vintage wine.